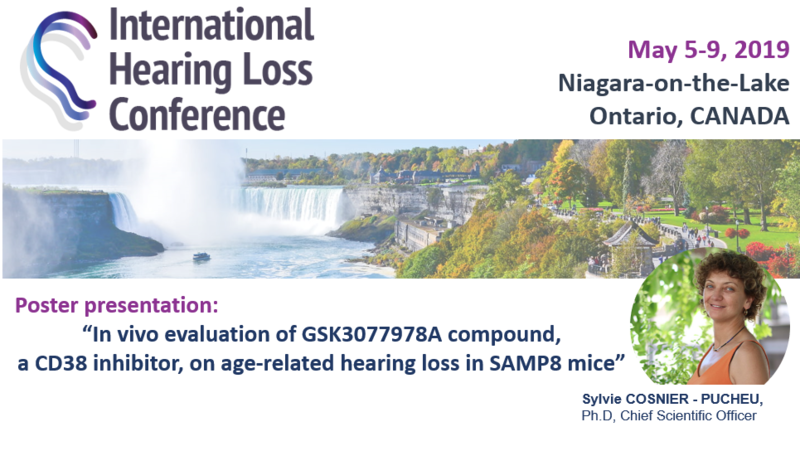 CILcare sponsors the upcoming International Hearing Loss Conference on May 5-9, 2019 in Niagara-on-the-Lake, Canada. Come and meet Sylvie COSNIER-PUCHEU, CSO, to discover our poster presentation describing in vivo evaluation of GSK3077978A compound, a CD38 inhibitor, on age-related hearing loss in SAMP8 mice. Age-related hearing loss (ARHL) is the most common sensory disorder in the elderly population, affecting 1 in 3 people over 65 years old. This disorder impacts the quality of life, and can severely affect communication, leading to social isolation, depression, and reduced physical and psychological well-being.